I spy this Gladia metallic leather sandals by the legendary Oscar De La Renta. This eye candy is so glamorous, it is crafted with gold leather, flexible side straps and it currently goes for £540. If you are up to the splurge, grab it here. Here are my favourite looks at the 19th annual Critics Choice Awards 2014. Nia Long looked amazing in this black mesh cut out gown by Jovani. I love that dress on her. 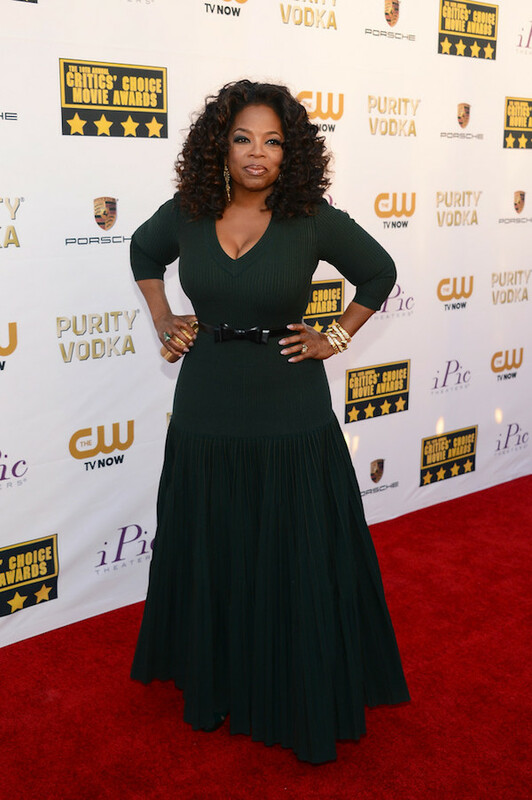 Oprah showed off her hour-glass figure in this emerald-green dress by Azzedine Alaia. She nailed it. Aisha looked elegant in this beautiful lace dress by Tadashi Shoji. Well done Aisha. This stylish diva looked fab in this black lace trimmed jump suit by Elie Saab. Juliette looked great in this red Zac Posen dress. Love her look. So I saved the best for last. Lupita looks amazing in this white dress by Calvin Klein. This is definitely my favourite look. I have my eyes on her from now on.